Ahem. What a name for a polish! One of the things I like about some indie brands is that they offer grab bags. They're mystery grab bags that usually range from $20-$25 for around 5 polishes. This is a great steal because these days you can easily spend $30 on just 3 indie polishes. The indie world is still a bit overwhelming for me. If I like a brand, but I can't decide what I really want to get, a grab bag is the perfect way to go for me. The cool thing about grab bags is they often include prototypes or limited edition polishes you can no longer purchase in the regular rotation. When I do group gift exchanges I often put indie grab bags on my wishlist. That's how I ended up with this polish from Darling Diva! I've always liked this brand, but when it comes down to deciding what I want I can't make up a mind, so a grab bag does that for me! 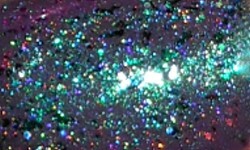 Beau Job is a color shifting shimmer pigment (green-blue-purple shift) with multichrome flakies in a clear base. Color: This is one of the coolest nail polishes I've ever seen. It's like all the magical unicorn power in one polish. The color shifting shimmer is strong and vibrant on the nails and the multichrome flakies really add beautiful dimension. This polish is liquid magic. Formula: Excellent formula. I used one coat. It applied easily and smoothly. Price: This one is no longer available for purchase, but I got it in a grab bag, so you may score one too the same way. Darling Diva grab bags are $20 and can be found on her site. Overall: I don't have another polish even remotely like this one. This is gorgeous and so unique and complex. What's interesting is the duo it was released with, it was paired with a lighter purple. I personally think you really get the best effect with this polish layered over a dark color. That color shift really pops against dark colors. This is a great topper and I'm very impressed.